Two weeks... that's all Jonathan said he needed. ?For two weeks Grace and Jonathan would hide me from an enemy that until recently I didn't even know existed. ?It sounded logical, but when has love ever proved to be logical? ?The catch? ?Grace's plan involved traveling--and traveling meant taking a trip back in time to Marensburg, Pennsylvania, where Jonathan grew up more than 150 years ago. ?The idea was scary, but kinda cool. Grace's plan was simple. ?While I hide in the past, Jonathan would stay in present-day Andersen where he'd train a special regiment of Lebas to fight against the legion of intruders who (according to Eric) are on their way to destroy me. ?Why me? ?And why a whole legion? ?When I finally discovered the answers to those questions it put everyone's nerves on edge. ?But Jonathan believed keeping me safe would help him focus, so I was willing to go. Nothing is ever simple, however. ?I knew something was wrong when I discovered my mortal body couldn't travel. ?When I woke up, I was in the body of Eleanor Hastings, Jonathan's first love. ?I admit that for the first two weeks I didn't mind being Eleanor. ?Eleanor was beautiful--the absolute embodiment of perfection. ?She turned heads wherever she went. Moreover, she had full use of her left hand! But two weeks became three, then four, and eventually months passed with no word from Grace or Jonathan. Then I discovered that Eleanor was still present inside me, and she didn't feel about Jonathan the way he felt about her. Her strong desire to surface and be with the man she loves has created an inner conflict I'm having difficulty controlling. So, here I am, trapped in 1864 with no way to return to the present. ?I hope someone, someday, finds this diary. ?I'm trying not to consider the possibilities of what went wrong, and it's unbearable to accept the only possible explanation that makes any sense--Jonathan and Grace aren't coming because the intruders won.? Will I ever be Beth Arrington again? 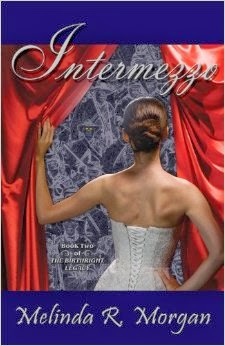 I have to admit, I have been waiting anxiously for Intermezzo to be released. I was thrilled beyond words. There is so much more to this story than I ever thought possible. Eleanor's father causes drama for Beth and the rules of society are not easy for Beth to follow. It is no wonder that Mrs. Weddington thinks that Eleanor is possessed. We are introduced to life in the 1800's and many new characters. Thoughtful, noble, caring and perfect are just some of the words I will use to describe William. If you have read Etude, you have to read Intermezzo and enjoy the story of 2 young ladies sharing 1 body and each in love with a different young man. Intermezzo is perfect as the sequel to Etude and the precurser to Coda. I cannot wait to get my hands on Coda - the final book in the Birthright Legacy trilogy. One of the many things I love about Melinda Morgan's books is that the titles perfectly describe the book. Just as Etude was a book that followed the format of an actual etude - beginning simply and growing increasingly complex as it came to the end, Intermezzo serves as a bit of a "break" from the main storyline taking place in the 21st century. At the end of Etude, Beth Arrrington "travels" to the 1800's in order to escape the evil Bailey. When she arrives in the 1800s however, her soul is trapped within the body of Eleanor Hastings. Not only does Beth struggle to conform to the societal requirements of Civil War period Pennsylvania, but she must find balance between her needs and Eleanor's. While we get a little break from the war raging between the immortals, we gain much needed insight to the complex relationship between Jonathon and Eleanor - not to mention the relationship between Beth and Eleanor that we didn't even know existed! The glimpse of Jonathan's life in the 1800s that we got in Etude is simplistic at best. With Intermezzo we get so much detail about that time period and we learn so much about Eleanor and begin to glimpse just how complex things can get where immortals are involved. I experienced a wide range of emotions while devouring this book. At times there was sorrow, then laughter. My heart ached for Beth, Eleanor, William and Jonathan. I was frustrated with Eleanor's parents, but sympathetic also. There is definitely and underlying theme of living up to your birthright - and the consequences that come if you choose not to. FYI - For the most part a clean read - a couple curse words along with some violence and some reference to intimacy, but no open-door intimate scenes. Honest disclosure - recieved copies of the book in exchange for an honest review.